Each week, members receive at least 8 different items featuring both fruit and vegetables in a black plastic bin. Our bins are always heavy with the peak of the season fruit. Herbs, honey, maple syrup and flowers also make regular appearances. The season begins in early June and ends in early October (18 weeks). Members also enjoy the ability to buy extra produce at reduced prices using the Beyond the Bin option. The plastic plastic bins are about the same size as a half bushel. They stack and nest well, and work well for storing in our cooler and for delivering fresh produce. Each bin is labeled with the members name and you welcome to take and return a bin each week. 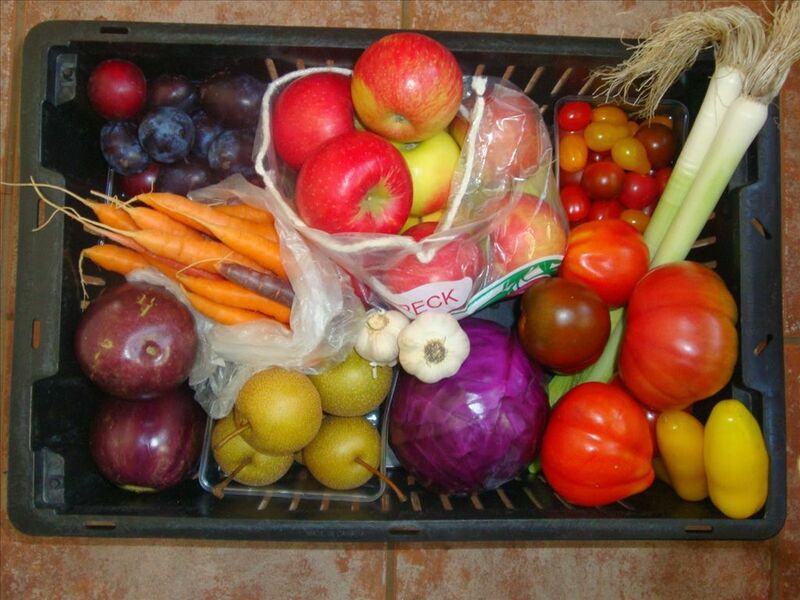 Home > Peak Season CSA > What is in a Bin? Each week, a standard share holder receives at least 8 different items featuring both fruit and vegetables in a black plastic bin. A small share holder receives at least 4 different items, half of the size of a standard share. Our bins are always heavy with the peak of the season fruit. Herbs, honey, maple syrup and flowers also make regular appearances. The season begins in early June and ends in early October (16 weeks). Members also enjoy the ability to buy extra produce at reduced prices using the Beyond the Bin option. The plastic bins are about the same size as a half bushel. They stack, nest, and work well for storing in our cooler and for delivering fresh produce. Each bin is labeled with the members name and you are welcome to take and return a bin each week. The last bin of the season will be packed in a cardboard container. For more detail about what items to expect to find in the bin, go to Seasonal Produce Calendar. This page last updated on 1/12/2016.